Here’s a decorating secret for you. Do you know how to update and refresh the look of a space in mere seconds? Simply change out a pillow or two and you’ll instantly have a fresh, new feel to any spot in your home! That’s it – you don’t have to do anything else! Easy peasy – right? 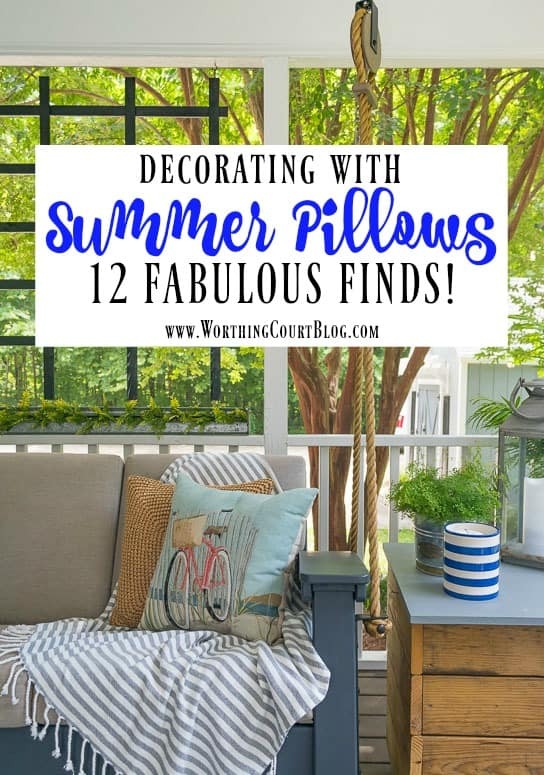 So, with that in mind, I’ve rounded up a great collection of very affordable summer pillows and pillow covers to help you do just that. Affiliate links have been used, which allows me to make a small commission based on your online purchase, but at no additional cost to you!. See my full disclosure HERE. This pillow is part of the Better Homes & Gardens line at Walmart and was an unbelievably low price – less than $15! Oh, and that natural woven throw pillow? You can find that one right HERE for a fraction of what it would cost you at Pottery Barn! It’s woven, straw-like texture is pure perfection when it comes to adding that summertime feel. 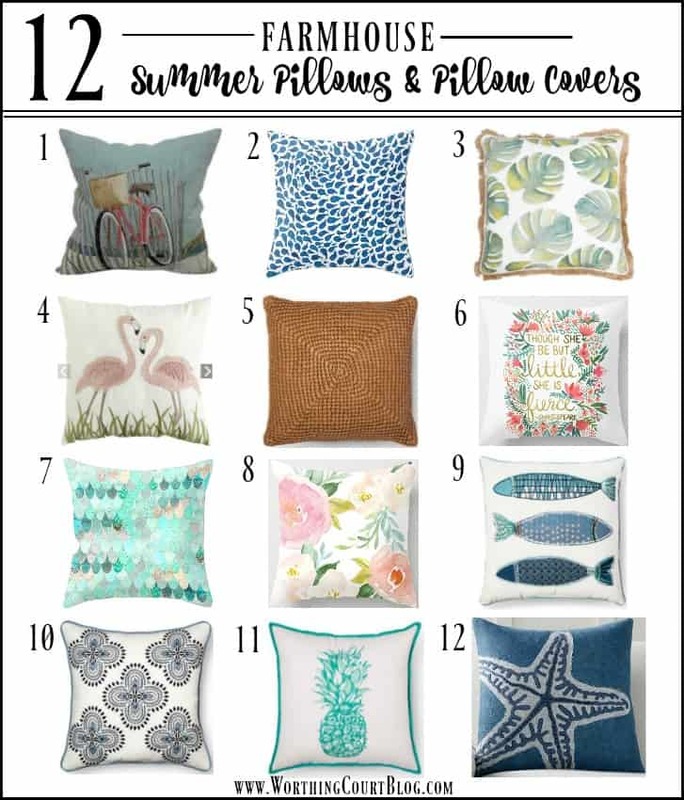 And just in case this cutie isn’t quite your cup of tea, I rounded up more affordable summer pillows and pillow covers. Most of the pillow covers are available in multiple sizes. Each pillow has a different look, but they all would fit right in with any home decor. Mix and match to your heart’s content! This is in no way a sponsored post, but y’all know that I love to share great finds with you whenever I come across them. And by the way, the porch refresh is finally complete so I’ll be able to share it with you in just a very few days! Your porch refresh is looking great so far! Cannot wait to see the final reveal! Loving the swing with rope…..that’s what I have on my birthday wish list! YAY! A pillow post!! I think I have to have # 8. Love the pillows especially the water color pillow – so pretty. 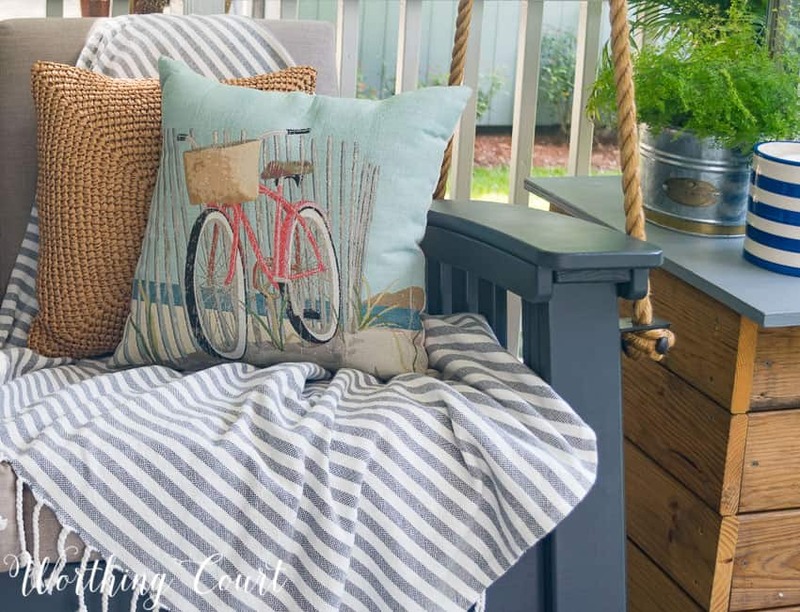 Love the pillows and that porch swing!!!! Happy Summer! I LOVE that bicycle pillow! I crochet and that woven pillow looks like an easy pattern that I have. I could make with some type of natural straw looking yarn. Can’t wait to see the reveal of your porch! Love the pillows. Enjoy your weekend. I LOVE both of the pillows on the bench! Thanks for sharing! Have a wonderful weekend, Suzy! 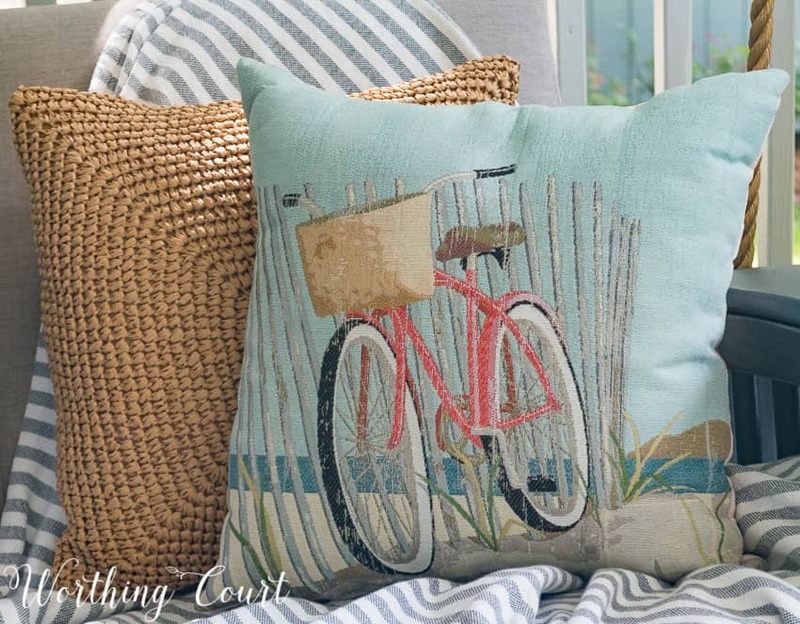 I love the bicycle pillow! Too cute! Oh my gosh! I just read this blog and RAN to Wal-Mart to pick up a couple of the B H & G pillows! Who knew?? I would have never thought to look there for such great pillows. I also just ordered two of the woven pillows from Target. So excited! Thank you for making it so easy to switch up accessories for the different seasons!! I love how a pillow can change the whole feel of a room! I love the pillows on the sofa. And thanks for direction on where to buy them. Love the bicycle one. How charming your porch is! You definitely captured the inviting feel you were after! I’m envious of the friends that get to spend time with you in your outdoor room! I love the pillow covers! It’s such an easy and affordable way to change up the look in your home with the seasons. Over the weekend I came across the natural woven indoor/outdoor pillows at Kohl’s on CLEARANCE for $8.99, plus they have an additional $10 off $50 spent in the home dept through July 30. This would be an excellent time to stock up on some great pillows at an amazing price!! Love your blog, so many helpful tips for decorating!! Thank you ? I love switching my decorative pillows in my den to match each season. It’s so much fun and my family and friends always look forward to seeing which pillows I have put out! Thanks for the great suggestions. These are nice summer pillows I love aqua and turquoise especially.